Within the month of September are various observances dedicated to raising awareness about important health topics, such as atrial fibrillation, aortic disease, pediatric cardiomyopathy, childhood cancer, as well as cardiovascular diseases. Atrial fibrillation, also known as Afib or AF, is the most common type of heart arrhythmia (irregular heartbeat). The US Centers for Disease Control and Prevention estimates that up to 6 million people in the US have Afib. StopAfib.org, a global atrial fibrillation patient organization, has helped lead the Atrial Fibrillation awareness campaign, which is designed to increase the understanding of Afib and better inform patients and health care providers about this complex condition. When a person has Afib, the beating in the upper chambers of the heart (atria) is unpredictable and sometimes rapid. As a result, blood doesn’t flow as well as it should from the atria to the lower chambers of the heart (ventricles). Normally, the heart beats 60 to 100 times per minute. When a person has Afib, the heart rate can be as high as 175 beats per minute. Afib itself is not life threatening. However, the irregular heartbeats associated with Afib can cause blood to collect in the heart and potentially form a clot. The clot could break free and travel to a person’s brain, causing a stroke. The National Stroke Association reports that Afib raises a person’s risk for stroke by 500%, and Afib-related strokes cause more deaths than other strokes. Afib generally does not go away. Your health care team can explain the various treatment choices and help you develop a plan of care. For more information, visit StopAfib.org or the CDC website. What are thoracic aortic aneurysm and aortic dissection? Thoracic Aortic Aneurysm and Aortic Dissection describe forms of aortic disease. When the walls of a section of blood vessel become weak and thin, it results in a bulging or ballooning of the vessel that is commonly called an aneurysm. Dissection is the tearing of a blood vessel’s inner lining, causing blood to leak between the layers of the vessel wall. An aneurysm may tear (dissect) or completely rupture. Under certain conditions, a blood vessel may dissect even when there is no aneurysm. When the aneurysm and/or dissection involve the aorta (the main artery leading away from the heart), the bulging and tearing are considered among the most serious, life-threatening conditions. However, the diseased aorta can be successfully treated, especially when found before an emergency occurs. The US National Center for Health Statistics reports almost 15,000 aorta-related deaths (including both the thoracic and abdominal aorta) each year. For more information, visit Aortic Dissection and Thoracic Aortic Aneurysm. Visit Aortic Hope to learn more about receiving support and joining a community of aortic disease patients, survivors, and caregivers. This community’s goals are to spread hope, create awareness, and provide support during the recovery and management of aortic disease. Families, caregivers, charities and research groups throughout the US observe September as Childhood Cancer Awareness Month—a time to honor and remember children and families affected by cancer. Cancer is the leading cause of death by disease in children. The American Cancer Society (ACS) estimates that about 10,590 children in the US under the age of 15 will be diagnosed with cancer in 2018. While childhood cancer rates have been increasing slightly over the past several years, the ACS reports that because of major advances in treatment, more than 80% of children with cancer now survive 5 years or more. The causes of most childhood cancers are not known. About 5% of all cancers in children are caused by a genetic mutation that can be passed from parents to their children, according to the National Cancer Institute (NCI). Other symptoms are also possible, depending on the type of cancer. Children’s Cardiomyopathy Awareness Month—recognized in September and sponsored by the Children’s Cardiomyopathy Foundation (CCF)—is designed to educate the public about pediatric cardiomyopathy, a potentially life‐threatening heart condition that affects how the heart muscle pumps blood. Pediatric cardiomyopathy is the number one cause of sudden cardiac arrest and heart transplants in children, and according to the Pediatric Cardiomyopathy Registry, one in every 100,000 children in the US under the age of 18 is diagnosed with cardiomyopathy. Cardiomyopathy is a chronic disease in which the heart muscle becomes abnormally enlarged, thickened, or rigid. As a result, the heart can no longer contract or relax normally. As cardiomyopathy worsens, the heart becomes weaker. Eventually, the heart loses its ability to pump blood through the body and maintain a normal electrical rhythm. Irregular heartbeats (arrhythmias) and heart failure may occur. Cardiomyopathy is a complex disease with symptoms and causes that vary considerably. Some affected children may have no symptoms while others may have a heart murmur, show evidence of heart enlargement, and experience shortness of breath, rapid breathing, or extreme fatigue. The cause of cardiomyopathy is not always identified, but viral infections and familial inheritance are primary causes. The CCF reports that many children with cardiomyopathy can lead a relatively normal life with few lifestyle restrictions. There will be more frequent doctor visits for monitoring of the condition and daily cardiac medication; and depending on the cause, type and stage of the disease, other modifications may involve diet, restriction from competitive, contact sports, and minor school accommodations. For more information, visit the Children’s Cardiomyopathy Foundation website. 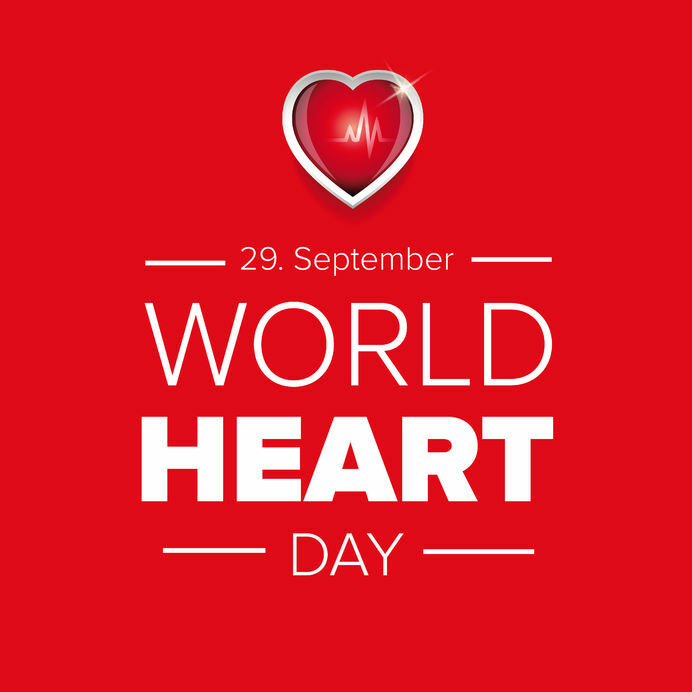 Created by the World Heart Federation, World Heart Day—September 29—serves as a platform to bring awareness to cardiovascular diseases (CVDs), which include heart disease and stroke. According to the World Health Organization (WHO), CVDs are the world’s leading cause of death globally, claiming 17.5 million lives each year. Most cardiovascular diseases can be prevented by addressing behavioral risk factors such as tobacco use, unhealthy diet and obesity, physical inactivity, and harmful use of alcohol. The WHO reports that at least 80% of premature deaths from heart disease and stroke can be avoided if these risk factors are eliminated. In addition, people may have difficulty breathing or shortness of breath, feel sick or vomit, feel light-headed or faint, break into a cold sweat, and become pale. The World Heart Federation encourages everyone to make heart-healthy choices wherever they live, work, and play.